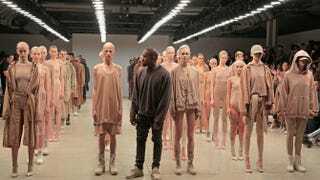 Kanye West (center) poses during the finale of his Yeezy season 2 during New York Fashion Week on Sept. 16, 2015, in New York City. In what will surely incense his critics, Kanye West recently called for “multiracial women only” in Sunday’s audition for his upcoming “Yeezy season 4” casting call, questioning some to ask if he’s really asking for light-skinned, curly-haired women. Though the self-hailed musical genius showed explicit black love during his recent broke-the-internet video, “Fade,” with Teyanna Taylor and her fiance, Iman Shumpert, of the NBA-champion Cleveland Cavaliers, West caught some fade with his latest escapade. He also had some defenders who say that “multiracial” doesn’t necessarily equal “light-skinned” and that he can cast whomever he wants. Maybe he wants our multiracial sistren to match his beige clothes?